'These classifieds are paid by each individual advertiser.' The Hong Kong Veterinary Association neither endorses nor has an opinion on any advertisement. Respondents are advised by HKVA to follow commercial due care when replying to any advertisement. The HKVA actively discourages the practice of copying advertisements listed on this webpage for advertising purposes by anyone other than the original publisher. Please also refer to Part II D. 'Professional Relationship between Veterinary Surgeons and Lay People (Other than clients)' point 12-15 in the Code of Practice for the Guidance of Registered Veterinary Surgeons published by the Veterinary Surgeons Board of Hong Kong in 1998. Patel Veterinary Clinic is a well-established small animal practice in Yuen Long. Our Clinic is fully computerized and well equipped with IDEXX blood test machine, digital X-ray, dental machine and Esaote ultrasound etc. We are looking for a full time or locum Veterinarian to join our friendly team. Candidate should have relevant clinical working experience, fresh graduates with right attitude will also be considered. A right candidate will be expected to work 5 days per week and salary will base on their experience and requirement. Included benefits are annual leave and continuing education allowance as well as professional liability protection. We are an established Veterinary Clinic based in Tsuen Wan. We are dedicated to providing professional and ethical Veterinary Health Care services. Our clinic is well-equipped with some of the latest medical equipment. We are looking for motivated Veterinary surgeons and Full Time VA's with a good attitude to strengthen our team. We offer a competitive, experience based remuneration package. Our opening hours is 10am - 8pm, The successful candidate would be expected to work 5 days per week. Best Life Animal Hospital is a well-established veterinary hospital located in Yuen Long, New Territories. We are looking for full time/locum veterinarian to join our team. Fluent spoken and written English and Cantonese, good in computer skills, mathematics and client interaction. Minimum 8-year experience working in a veterinary hospital. 3-5 years of experience in a supervisory role is preferred. Possession of AIRC Cert IV or above will be an advantage, but not essential. Good computer skills i.e. Microsoft Office suite (Previous practice management software knowledge preferred). Interpersonal skills with staff and clients and work well in a team environment. Form 5, fluent spoken and written English and Cantonese. Minimum 1-year working experience, be an animal lover, priority will be given to candidates with working experience in customer service / animal hospital. Provide face-to-face service at clinic. Handle customer enquiries on products, services etc. Working hours 10:00am-8:00pm, 5 days work. Interested parties may e-mail their applications along with their CV and expected salary to vet@petelements.com.hk. 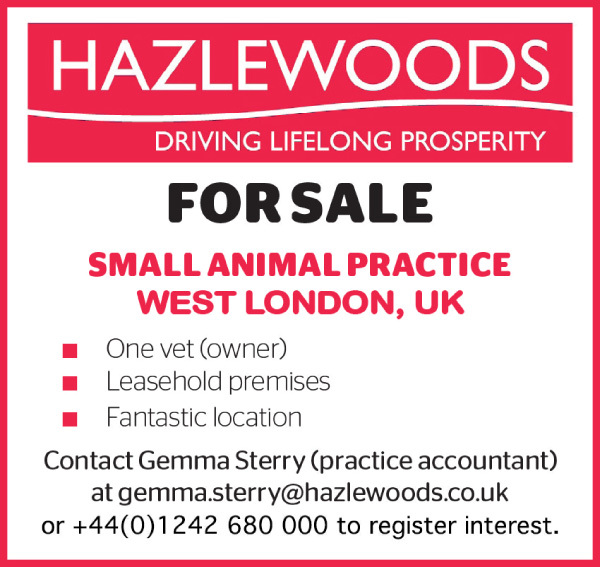 A confident small animal clinician with at least 3 years' experience. A compassionate, caring individual with high standards. Skill in communication with clients and colleagues. Current HK Veterinary Surgeons Board Registration. Flexible days. 2,3,4 or 5 day working week to fit your needs. Salary of $50-75K that reflects your experience and contribution. $25K plus paid time off for CPD or formal training courses and personal growth. Support for individual learning plans. Pro rata benefits for part time work. If you are looking for a job which also has long term prospects, Take this opportunity and join our progressive clinic. PPC 動物診所 We are a professional veterinary clinic in To Kwa Wan. Our practice is fully computerized and well-equipped with the most advanced IDEXX Procyte CBC, Catalyst One blood test machine, digital X-Ray, iM3 dental machine, Esaote MyVetOne Ultrasound and anaesthetic monitoring equipment, etc. The package will include a salary commensurate with experience, generous paid annual leave, paid study leave, plenty of in-house training and support. Salary is commensurate with experience and ability. All staffs are valued at our hospital as we aim to provide a friendly working environment. Prince Animal Clinic is looking for a new veterinarian to join our team with two other senior veterinarians at a busy clinic located at Prince Edward. We are a busy and well-established professional Hospital with an excellent reputation in Hong Kong. 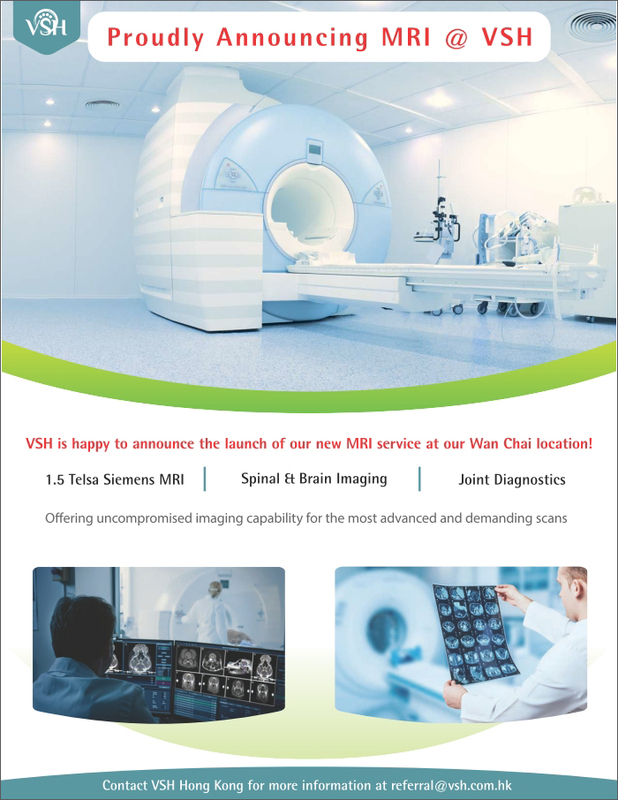 The Hospital is well equipped and has color doppler ultrasound, Digital CR radiography, fully equipped diagnostic laboratory with hormonal assay capability, endoscope with biopsy and retrieving devices, Orthopedic equipment, anesthetic monitoring equipment with eosophagus ECG and constant Blood pressure measuring device, positive pressure ventilation. A position has opened up immediately for a successful candidate. Both experienced and newly graduated veterinarian are welcome to apply. Enthusiastic and compassion towards animal. Skills in Traditional Chinese Therapy and/or Acupuncture would be a plus. The candidate should have strong interpersonal skills, be a team player committed to the growth and reputation of the clinic, be self-motivated and have the ability to work under pressure. Interest in further education and development of skills. Salary will be commensurate with experience, ability and performance. Included benefits are monthly commission, annual leave and continuing education allowance as well as professional liability protection. The successful candidate would be expected to work 5 or 6 days per week. All information collected is for recruitment purpose only. Please email your full resume attention to Sam Chan clinic manager at princeanimalclinic@gmail.com. 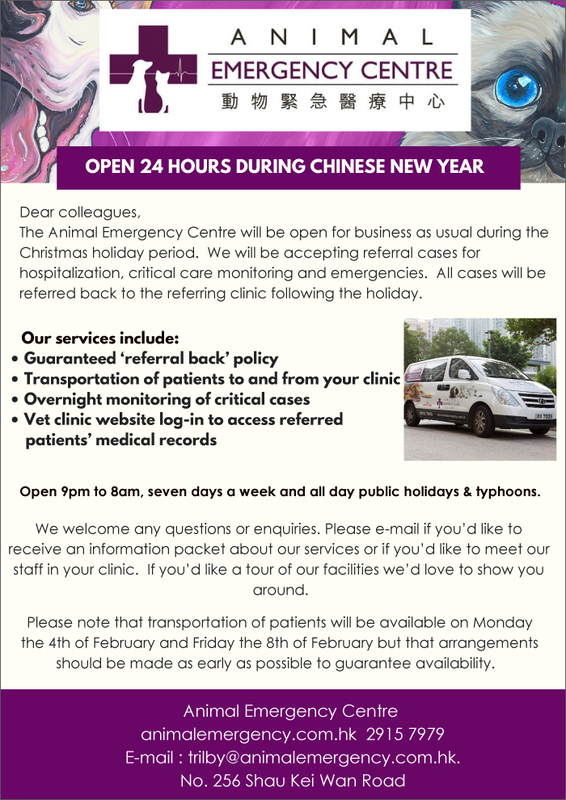 Pets Central is a veterinary group in Hong Kong with 4 practices, comprising a referral hospital, an ER/care 24 hours hospital, 3 general practices, and a mobile clinic. Pets Central is seeking expressions of interest from Hong Kong registered or registerable veterinary surgeons to work in our hospitals. Hong Kong is an exciting city and a gateway to Asia. You will enjoy low tax rates with good indoor and outdoor leisure facilities for time off. We need an additional versatile vet who loves communicating with diverse clients and is happy to teach others. Duties will include lecturing and teaching in Asia, televeterinary support of veterinarians around the world, ultrasonography, support of our GP veterinarians, and direct case management. If you have a strong background in practice with a membership / fellowship or other similar post graduate qualifications in small animal veterinary medicine. At least 10 years post graduate experience required. We have all the equipment you will need, and a good team of supportive vets who want to learn. In return, you will enjoy all that Hong Kong has to offer, whether you like city life or rural living. Overseas applicants will receive support with registration in Hong Kong. If you are interested please send your letter of interest and resume to hr@pets-central.com. Preliminary enquiries can be directed to drpauline@pets-central.com. New Sun Veterinary Clinic in Yuen Long is looking for a new veterinarian to join our team. We are a well-established Veterinary Clinic. We have computerized record system, and well-equipped with digital x-ray, ultrasound scanner, full IDEXX in-house machine and fully equipped surgery theatre. Both experienced and newly graduated veterinarians are welcomed to apply. Salary (and bonus) will be commensurate with experience, ability and performance. Benefits are monthly commission, annual leave. The successful candidate would be expected to work 5 or 6 days per week (48 hours). City University of Hong Kong is a dynamic, fast-growing university that is pursuing excellence in research and professional education. As a publicly-funded institution, the University is committed to nurturing and developing students' talents and creating applicable knowledge to support social and economic advancement. The overall aim of the Project is to improve pig health and production in individual pig farms while enhancing the economic and environmental sustainability of pig farming in Hong Kong, for the benefit of individual farmers as well as society in general. The objectives are to identify the constraints to achieving higher pig health and productivity in Hong Kong; and develop interventions to improve pig productivity, health and welfare, as well as food safety, economic and environmental sustainability. A DVM or equivalent from a HKVSB recognized institution is required.For post (1), proficiency in Cantonese and Putonghua is desirable. 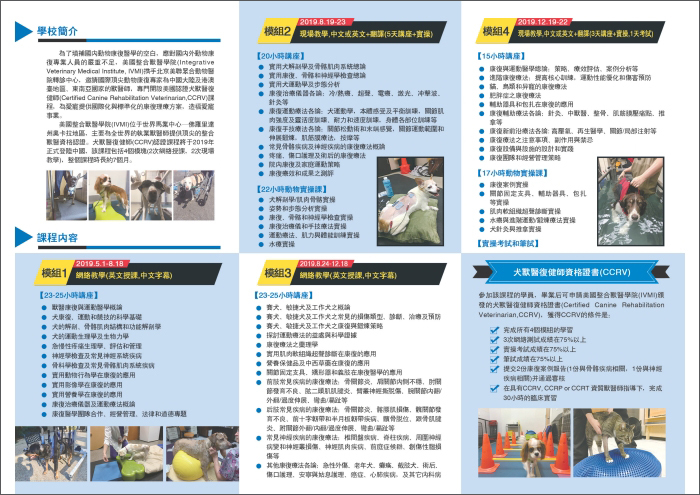 For post (2), holder of a valid Hong Kong driving license (Class 1 and 2) and proficiency in Cantonese are also required. Proficiency in Putonghua is desirable. For post (1), at least 5 years' experience as swine practitioner; experience in commercial pig production; and practical experience in the management of major swine production-limiting diseases are required. For post (2), at least 2 years' experience in veterinary practice or any other relevant industry is required. For posts (1) and (2), experience in commercial clinic set-up (including in-house lab and pharmacy, and electronic record systems) is desirable. Ability to work along with translator across cultural barriers with farmers accustomed to low veterinary input. Successful candidates may be considered for appointment on a full-time or part-time basis. Salary offered will be highly competitive, commensurate with qualifications and experience. Fringe benefits for full-time appointment include leave, medical and dental consultations at the campus clinic. We strive to provide excellent service to all pets and their owners by our care, knowledge and experiences. Our patients include dogs, cats, birds, rabbits, chinchillas, terrapins and other exotics. We are equipped with surgical facilities, hospitalization, in-house blood test machines, dental machine, anesthetic monitor equipment, oxygen cage, isolation care wards, exotic wards and more. We are looking for people who have compassion in pets & veterinary services to fill in the following positions. Enthusiastic, caring and compassionate veterinarian with at least 1 years of experiences, confident in small animal medicine and competent in soft tissue surgeries & general imaging, radiography and ultrasounds. Specialty in exotics medicine and surgery, ultrasonography, orthopedic surgery, or acupuncture & TCM will be advantageous. Enjoy interacting with the clients and their pets. Be able to listen, understand and have empathy with clients, dogs and cats. Good communication and interpersonal skills. Clear and concise, in written and speaking. Be able to discuss solutions or options in a warm, confident and professional manner. Attention to detail, able to communicate with clients and staff efficiently. Have a confident, professional attitude, communicate clearly and stay calm under pressure. Be flexible with your working hours, while keeping an excellent work-life balance. Must hold practicing certificate of registration in HKVSB. Proficient in English and Cantonese speaking is a bonus. Willing to support company's adoption / trap-neutered-release program and have genuine interest in the welfare of animals. Occasion house calls are required. Holder of valid driving license (class 1 & 2) is preferred but not essential. Friendly working environment with well-trained vet assistants. Help to ensure smooth physical day to day operation of the hospital & contribute to the goals of the practice. A good understanding of small animal practice and quality service procedures. Remuneration will be commensurate with clinical experience, skills and performance. **New graduates or less experienced are also welcomed. Salary is negotiable and commensurate with experience, ability and qualification. Form 5, fluent spoken and written English and Cantonese, credit in computer skills, mathematics and client interaction. Minimum 1-year experience, be an animal lover, priority will be given to candidates with more related experience. Basic English-based computer / word processing skills. Possession of AIRC Cert II or above will be an advantage, but not essential. Self-motivated and willing to learn. Willing to support company's adoption / welfare program and have genuine interest in the welfare of animals. Excellent communication skills and problem solving skills. Salary and benefits are negotiable based on experience and qualification. Part-time will also be considered. Patel Veterinary Clinic is a well-established small animal practice in Yuen Long. Our Clinic is well equipped with all modern day facilities and fully computerized. A right candidate will be offer generous salary base on their experience and requirement. 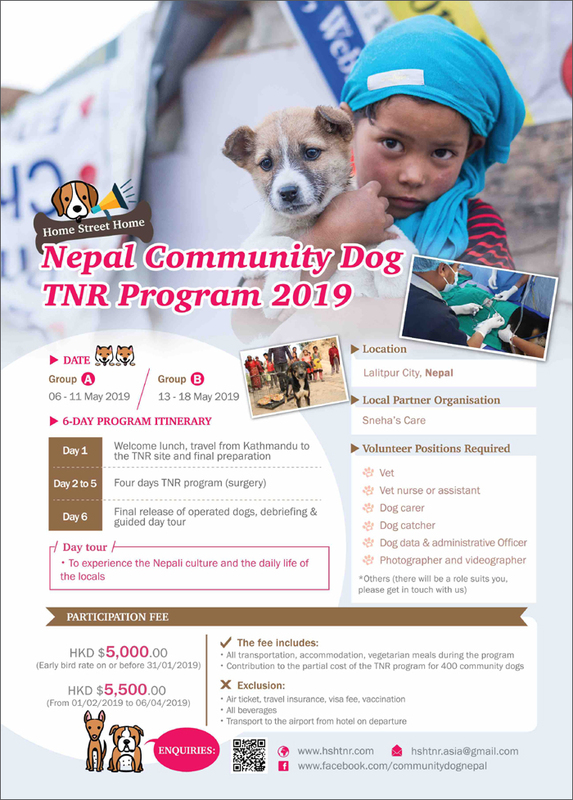 The Hong Kong Non-Profit making Veterinary Clinic (NPV) is a charitable organization aiming to bring affordable veterinary services to people and animals in need. NPV is one of the busiest vet organizations in Hong Kong with 24 hours vet services provided. We have 6 fully equipped vet clinics with 18 vets and more than 60 vet assistants, providing complete vet services to general public and strays animals. We currently have 9 openings, if you share our same mission and are interested in one of the listed vacancies, please send your full resume and cover letter to hr.recruit@npv.org.hk. We are an equal opportunity employer and welcome applications from all qualified candidates. The information provided will be treated in strict confidence and be used only for consideration of your application for relevant/similar post(s). Konning Animal Hospital is a professional well-equipped small animal practice with relatively spacious and comfortable working area located in Kowloon. Our supportive team are looking for passionate good team players to join us. Financial support for continuing education. We offer attractive salary & fringe benefit to successful candidates. Please send your full CV with recent photo, current & expected salary to starclinicrecruit@gmail.com. All information collected is for recruitment purposes only. Pulsevet provides house-Call veterinary services and treating both cats and dogs in the comfort of their own home throughout Hong Kong. We are seeking Veterinarians / Veterinary nurse and assistant who desire to work in a challenging environment and are focused on providing positive and friendly atmosphere for our clients and patients. Well equipped Hospital in Kowloon with 13 Team Players. Provide the best medical care to our patients. At Concordia Pet Care we believe that pets deserve the same level of healthcare as we expect for ourselves. We recently opened our brand new hospital in Happy Valley. We are well-equipped with a full range pharmacy, comprehensive in-house diagnostic laboratory, digital radiography, ultrasonography, endoscopy, computed tomography, advanced soft tissue, dental and orthopaedic surgery services and 24-hour hospital care. Our doctors and nurses work together as one harmonious team, as we strive to continuously raise our medical and service standards. We are looking for a committed veterinarian to join us. The ideal candidate will have at least 3 years of work experience, good communication skills and be a team player. Postgraduate qualification would be an advantage. Competitive salary and bonus commensurate with experience. Kowloon Cat Hospital is an established feline-only clinic and we are recruiting! We have recently built a brand new hospital and are looking for individuals to join our growing team. Applicants must enjoy working with cats and be able to communicate and connect with our clients in a professional manner. You will be working alongside very experienced vets, a qualified veterinary nurse and other friendly veterinary assistants. We strongly encourage continuing studies and many of our staff are enrolled in studying to attain their certification. No after-hours work is required. Salary and benefits commensurate with experience. We have a friendly and nurturing work environment, with reasonable work hours. We also offer medical benefits for all full-time staff. 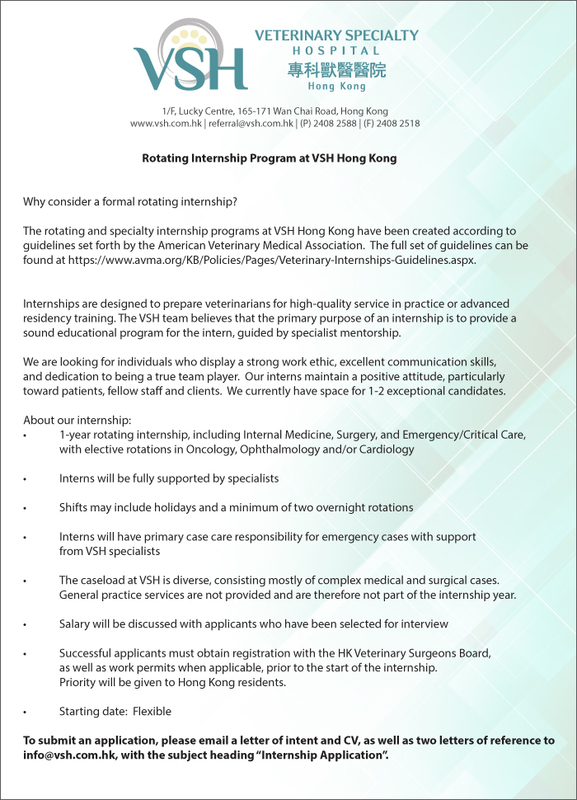 For interested parties please send full resume, position interested and expected salary to accounts@kowlooncathospital.com.hk. 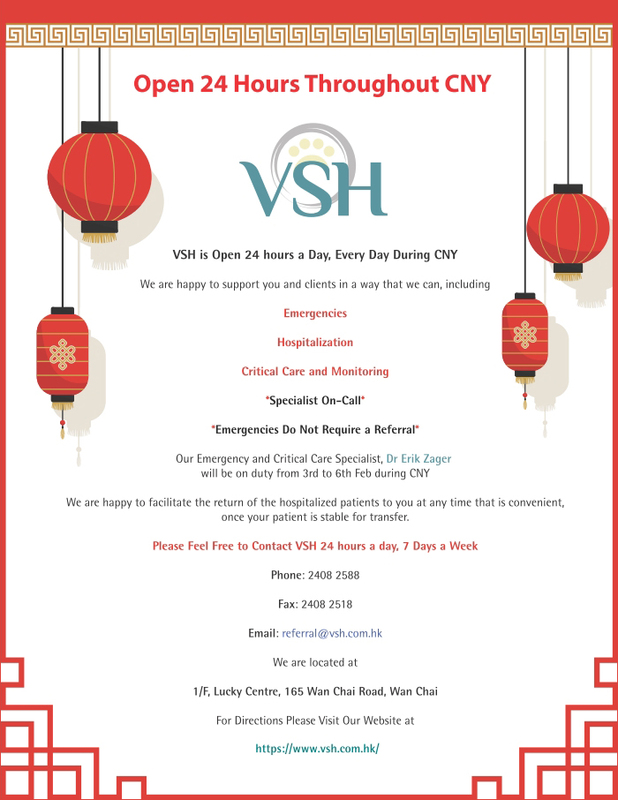 VSH Hong Kong is a world-class veterinary specialty and emergency hospital in the heart of Wan Chai. Our specialty referral and emergency caseload is large and continues to grow. To enhance our collaborative relationship with the referring veterinary community, we do not offer general practice services. We are looking for talented veterinarians to expand our Emergency Service (day and overnight shifts). To be considered, veterinarians must understand the importance of excellent and compassionate communication. We strive to meet the needs of our referring veterinarian community, create positive experiences that meet the expectations of our clients, and always remember that the patient comes first. Our specialists are on call to support the Emergency Service when needed. We currently offer specialty services in Surgery, Ophthalmology, Internal Medicine, Cardiology, Emergency/Critical Care and Oncology as well as 24/7 emergency services. Emergency clinicians work closely with our specialists and have the opportunity for day shifts assisting specialty services. Our nurses and support staff are incredible, and our Client Care Specialist team at reception works 7 days/week, well into most evenings. We offer a generous compensation and benefits package, commensurate with experience, and we strive to reward hard-working, committed team members. Our ER doctors work an average of 3.5 shifts per week, most of which include nights, weekend days, and holidays. Please email a letter of interest, CV and references in complete confidence. Care First Veterinary Clinic established in 2018 is to provide a variety of veterinary medical services for dogs and cats in Wong Tai Sin and surrounding areas. We are dedicated to providing professional and preventative health care, early detection of disease, and general medical and surgical treatment throughout the life of pets. We are to help our patients have a long productive life with as little pain and suffering as possible. If you are interested in joining our team, please submit your CV with recent photo to: carefirstclinic@gmail.com. Homevet offers dedicated mobile veterinary services throughout Hong Kong. Our main goal is to provide pet owners with personalised, professional and compassionate care in the comfort and relaxed atmosphere of their home. HOMEVET POSITION: VET REQUIRED FOR 2 MONTHS: JULY AND AUGUST. We know not every animal does well in a clinical setting, or being transported, and many benefit from being examined and treated at home whenever possible. We provide the highest standard of Veterinary Care and build long-term relationships with our clients. Really get to know the owner and pet and be able to develop a medical plan that makes sense for both. Enjoy a different "typical workday" than hospital consultations: one with time to spare for emotion and good communication. Time to witness the human-animal bond. We have IDEXX blood machine, doppler blood pressure, Esoate Mobile Ultrasound. Work with minimum 10yrs experienced nurses, plus professional driver. Working hours 9am to 6pm, 3- 4 days a week. HOMEVET POSITION: LOCUM VET FOR SATURDAY'S AND OCCASIONAL OTHER DAYS. We are also looking for addition locum vets to expand our service or provide occasional coverage, please reach out to us if you are available. We are also looking for additional experienced drivers (must be keen animal lovers) for part-time animal or vet team transportation. Must have Class 2 licence for both manual/auto. For interested parties please email a cover letter and your CV, photograph or queries to vet@homevet.com.hk (Fax 3015 8758 / Telephone 9860 5522) www.homevet.com.hk. We are a young, dynamic, and care-oriented clinic in Yuen Long centre. We focus on animal wellbeing and strive to provide the best possible care. Our facilities include two consult rooms, separate dog and cat wards, surgical unit, full range IDEXX diagnostic unit, esaote MyLab DeltaVET ultrasound, digital X-ray, iM3 dental until. We have one dedicated oxygen cage and one portable one. Our facility is capable of full range soft tissue surgery and basic orthopedics. At least 3 years experience in small animal field and able to do solo charge. Basic diagnostic and surgical skills required, additional interest in sonography, exotic medicine & surgery, TCM, acupuncture etc a plus. Candidate must be hardworking, self-driven and have good communication skills, possess good time management skills, and work well with others. For full time position, candidate expect to work 4-5 days per week, salary is pro-rated to working days and commensurate with experience. For locum, we offer $3500-$4500 per day depending on experience. Interested parties please send your CV, expected salary, and any reference letters, and a few dates available for interview to hr@wellnessvet.com.hk. Pets Central is seeking expressions of interest from Hong Kong registered or registerable veterinary surgeons to work in our hospitals. Hong Kong is an exciting city and a gateway to Asia. You will enjoy low tax rates with good indoor and outdoor leisure facilities for time off. If you have a strong background in practice with further studies particularly in S.A. medicine, and a well-documented history of improving your skills through high-quality continuing education we would like to hear from you. At least two years post graduate experience required. You will be working in a group with veterinarians who have expertise in general practice, cardiology, internal medicine, behaviour, acupuncture, dentistry, and oncology. You will have access to excellent clinical facilities, and support for your professional development. Our 24 hour Emergency Hospital has positions available for veterinarians who enjoy E.R. duties. At least three years post graduate experience required. The Ark Veterinary Hospital has been caring for Hong Kong pets for over 20 years. The full-service hospital has 24-hour emergency care, digital x-ray, Doppler ultrasound, ICU, surgical microscope, flexible endoscope plus a team of certified nursing staff. The Ark services both the wider veterinary profession and is part of the Doctors Beck & Stone group (http://www.doctorsbeckandstone.com) that has an additional 8 hospitals across Hong Kong. The Ark has an intern program nurturing new graduates as they develop into general practitioners. Doctors Beck & Stone culture focuses on team values and clinical support typified by the clinical development program that focuses on providing training across the team whilst supporting the development of clinical leaders in imaging, internal medicine and surgical disciplines. Basic salary HK50-70K pcm commensurate with experience, as well as performance-based pay. 14 shifts per 4 weeks. Training budget of HKD12K and 5 days leave. If you're ready for a fulfilling career, then apply in first instance with a covering letter and current CV to careers@drbns.com. 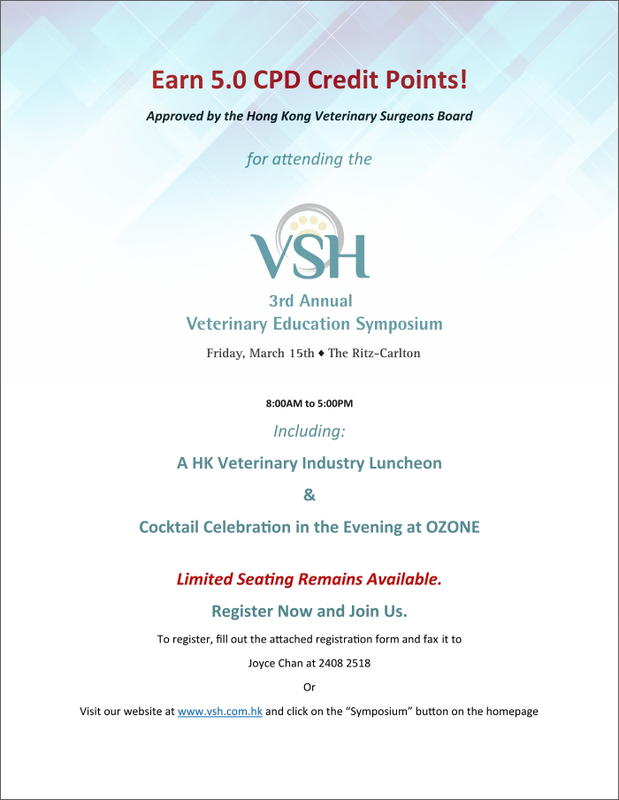 * Please preview the Veterinary Surgeons board of Hong Kong (http://www.vsbhk.org.hk) for professional eligibility. Comfort Veterinary Clinic is looking for a colleague. Our team includes 2 surgeon vet, dentistry, and extensive facilities: radiography, diagnostic ultrasound with doppler, BM3 vet monitor, BP Doppler, Tonopen, biochemistry analyser, haematology analyser, electrolyte and blood gas analysers, Kruse oxygen cages, infusion pumps, Ramble 100 dental machine, electrosurgical unit, flexible fibreoptic scopes (bronchoscope), full orthopedic equipment. Over 15 years we have developed a reputation for high-quality medicine and complex surgery. A full-time veterinary clinician who have confident in small animal medicine and competent in most surgical cases. Independent and able to work as a team. Skill in communication with clients, colleagues and volunteers. A sympathetic, caring approach with high standards especially while handle a busy caseload. Able to work effectively and under pressure. Candidate with good command of spoken Cantonese will be an advantage. Must have Practising Certificate issued by Veterinary Surgeons Board. No experience may be considered. Working Hours : 8 hours daily, Monday to Sunday, work on shift. Salary at HKD80K - 100K and benefits are negotiable based on experience and qualifications. Excellent interpersonal and organisational skills. Interested applicants please email resume and cover letter with expected remuneration to: job@meifoovet.com. G/F, 37 Wing Hing Street, Tin Hau. We are seeking confident and motivated individuals to join our friendly and professional team. Our multi-vet practice has been established for over 20 years and is centrally located on Hong Kong Island. We are committed to providing the highest level of veterinary service and are fully equipped with in-house laboratory, ultrasound, digital radiography etc. 2 or more years of practical experience is preferred. Candidates with lesser experience (including recent graduates) that possess a positive work ethos and an eagerness to learn will also be considered. Postgraduate qualification and special interests would be an advantage. Strong communication and interpersonal skills with the ability to work well independently within a team environment. Relevant work experience, 1 or more years is preferable but not essential. Fluent in both spoken and written English and Cantonese. Show initiative and an eagerness to learn. Have genuine love and compassion for animals. An attractive salary commensurate to experience and qualification. Encouragement and support for continuing education. Vet01 veterinary clinic established in 2018. We provide a variety of veterinary medical service for dogs and cats in Tsuen Wan and surrounding areas. Our animal hospital is fully computerized and being equipped with, in house IDEXX lab, UB CAMpro, Aniwear ECG, PetMAP II monitor, high quality digital X-ray machine, ultrasound, anesthetic monitor equipment and more. We are dedicated to providing professional and preventative health care, early detection of disease, and general medical and surgical treatment throughout the life of pets. Kadoorie Animal Hospital is a well-established small animal practice located in Mongkok. We are looking for motivated Veterinary surgeons with a good attitude to strengthen our team! All staffs are valued at our hospital as we aim to provide a friendly working environment. Doctors Beck & Stone is looking for high-energy senior surgeons and medical internists to expand the mature Ark 24-hour veterinary hospital. Certificate or membership advantageous. Cantonese not a pre-requisite. Basic salary HK80-110K pcm commensurate with experience, as well as performance based pay. 5 days per week on a rolling 7 days rota. Doctors Beck and Stone is seeking vets for our Discovery Bay Hospitals in Hong Kong. Discovery bay is located in Lantau Island which is in the southern part of the Hong Kong territory. It is a resort area designed for those who prefer to stay away from the hustle and bustle but also has a speedy connection with the outside world via a 30 min ferry to the famous Hong Kong Island. There is also access via bus, taxi and metro. Discovery Bay has a tight family orientated community with around 20,000 people of which 80% are expatriates. Island Vet Services and Doctor Beck & Stone North Plaza are the only Veterinary Clinics in the neighbourhood and as such the vets become local personalities. We have a fantastic team - receptionists who are conscientious with taking bookings, a nurse assisting in every consultation, and a team of doctors who work together and discuss cases. We are fortunate to have a lengthy consultation time of 30 minutes, which allows us plenty of time to discuss cases with owners to allow them to make informed decisions. Having plenty of time to converse with clients allows has allowed me to build strong relationships within the community and rapidly build a dedicated client base. Working in Hong Kong provides ample opportunity to learn about a wide range of diseases, and working at Doctors Beck and Stone is fantastic. I am able to provide a very high standard of care to our patients in a friendly and varied environment, resulting in a high level of job satisfaction whilst achieving a good work-life balance." - Dr Nick Smith, Island Vet Services. Both Discovery Bay clinics have dental and surgical facilities, digital x-ray and ultrasound. The 2 locations work as a team with 3 vets on the rota sharing the weekend work. The nursing team includes Philippines vets alongside bi-lingual nurse / translators, and the clinics are served by an ambulance. Basic salary HKD50-70K pcm commensurate with experience, and performance based pay. Housing budget for applicants willing to re-locate to Discovery Bay. 5 days per week on a rolling 7 days rota, no emergency out of hours work. 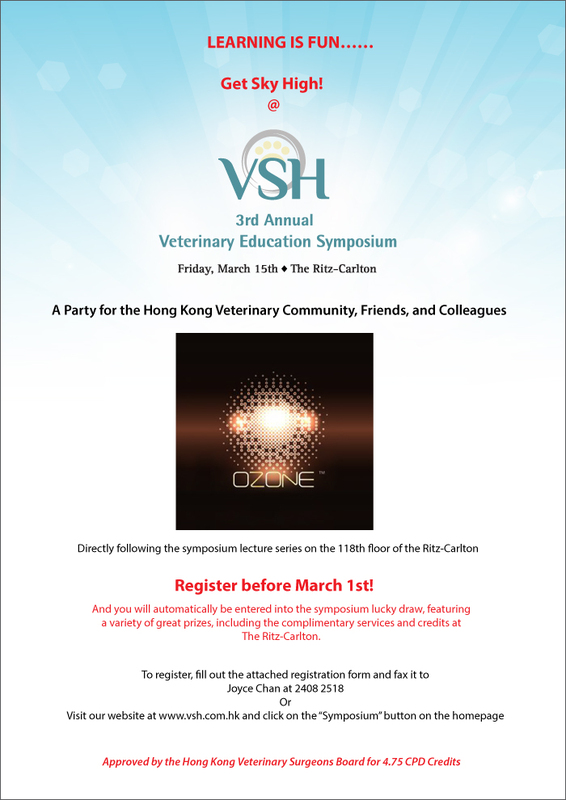 * Please preview either the Veterinary Surgeons Board of Hong Kong (http://www.vsbhk.org.hk) for professional eligibility. Neighbor Animal Clinic is a well-established small animal practice located in Kwun Tong. Our practice is fully computerized and well-equipped with the most advanced IDEXX CataylstOne blood test machine, digital x-ray, dental machine, ultrasound and anaesthetic monitoring equipment, etc. Our Clinic (in New Territories) is seeking to employ veterinarian and veterinary assistants. 1~2 year working experience in small animal veterinary field is prefered. Looking for a dynamic, exciting and rewarding veterinary career? Want to develop and perfect your abdominal and cardiac ultrasound scanning? Love interacting with and helping your colleagues manage their cases? Then this position is for you! Hong Kong Mobile Veterinary Ultrasound Service (HKVUS) is looking for a veterinarian to join our mobile ultrasound service. The candidate needs to be outgoing and hard working and must have previous solid ultrasound experience and medical background. Necessary additional ultrasound training will be provided to the right candidate in the form of lecture, real-time scanning sessions and side-by-side scanning in hospitals. The high number and variety of cases seen every day, combined with a very attractive compensation plan make this a fantastic opportunity for the right candidate. Days entail collection from home, visiting clinics and hospitals across Hong Kong with the vets as your clients. Rolling 5 day rota. Basic salary HKD60-70K pcm plus performance based pay, HKD12K training budget per annum, 4 weeks annual leave plus 1 weeks training leave per annum. Hong Kong is a vibrant city with ample opportunity for a good social-life or shopping, every sport one can imagine, hiking on the hills or water sports. It is an ideal base for travelling around both Asia and China mainland. Sheung Shui Veterinary Clinic is well established small animal practice located at Sheung Shui. Our practice are well equipped. We are looking for junior or experienced Veterinarian who are interest to join our team. Generous competitive salary based on experience and flexible working day. Doctors Beck and Stone is seeking commercially minded vets to take ownership of our Yuen Long Hospital. The position would suit an all-round practitioner with 2 or more years' experience, competent in all basic soft tissue surgical procedures, a solid medical background and a commitment to the provision of dentistry, who understand how to provide good service and the benefits of pro-active client follow-up. This is a rare opportunity for a vet to drive the direction of the hospital building on the established client base. With a committed and passionate nursing team, the hospital has full laboratory services, x-ray, and ultrasound. Clinical team support will be provided by the well-established Doctors Beck and Stone clinical management team, with case support easily accessible through the on-line management system. Quarterly team training and a very active clinical support WhatsApp thread ensures that all team members are regularly engaged and well-informed of clinical developments across the group. Currently the rota structure lends itself to two 7 or 8 day work stretches that would constitute 16 days per month and allow useful blocks of time off for the candidate to pursue hobbies and take vacation. Yuen Long is an up and coming area of Hong Kong on the border of China mainland. With a thriving population of 200,000 and growing. Yuen Long has good bus and overland train communication, excellent shopping and easily accessible rural villages. Basic salary HKD40-65K pcm commensurate with experience, as well as a monthly commission bonus on a fixed target. 16 days per month, no emergency out of hours work. Northern Animal Clinic is a well-established small animal clinic in New Territories since 2006. Now we are looking for an enthusiastic, caring and compassionate veterinary surgeon. Experience in small animal medicine, surgery, or exotic animal practice is an advantage. New or recent graduate would also be considered. Our practice is equipped with computed radiography, Esaote colour doppler ultrasound machine, Cislak & Miltex dental set, IM3 high-speed dental unit, digital dental radiography, i-STAT blood-gas system, Idexx Procyte/Catalyst Dx/Snapshot Dx workstation, Storz endoscopy, tonovet, WA panoptic ophthalmoscope, Drager anaesthetic monitor, Doppler blood pressure apparatus, and full soft-tissue and orthopaedic instrument. We provide high quality medical and surgical service. You will be supported by a wonderful team of extremely competent and dedicated veterinarians and assistants. Basic salary HKD30,000 to HKD70,000 commensurate with experience and performance. Creature Comforts is Hong Kong's award-winning Veterinary Housecall Practice. Established for nearly 20 years, Creature Comforts has developed a reputation as one of Hong Kong's highest service veterinary practices, with an individual connection to all of our private clients. Creature Comforts provides relaxed, thorough and personalised consultations in the client's home, but also has the full support and backing of East Island Animal Hospital, Creature Comforts TKO clinic and the Animal Emergency Centre, as well as a dedicated back-office team and logistics network. We have been careful to always focus on quality, and due to continued growth we would like to add one vet to our team. We're looking for a person who understands the value of relationships and enjoys working with a smaller number of clients to achieve the highest quality results. The role could be part-time or full-time, depending on your situation and you would have your own driver. There would be no after-hours or public holiday work. Excellent English is important, but Cantonese is not required. If you'd like to experience a truly unique veterinary career, work with dedicated clients and see a completely different side of Hong Kong, we'd like to discuss with you further. Please contact Trilby at trilby@creaturecomforts.com.hk for further details. The Animal Medical Centre is looking for vets to join our existing team in one of the largest veterinary groups in Hong Kong. We offer a 4.5 day working week, with extensive time off. All clinics are fully equipped and have been operating for many years. 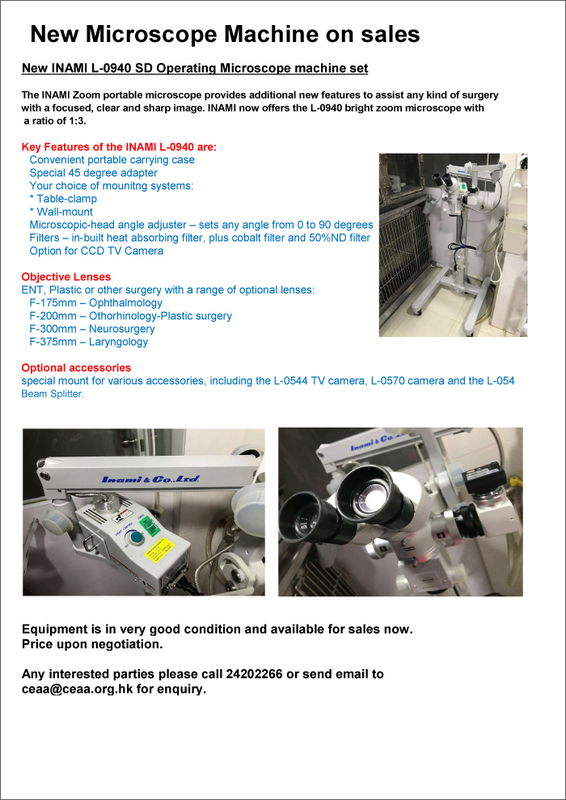 Available equipment includes colour Doppler ultrasounds, air drills, various plate sets, TTA Rapid, cryo, various sizes of endoscopes, op microscopes, tonovet, ERG, etc. The "right" new graduate would be considered. Salary is commensurate with experience and extra qualifications and a bonus based on productivity. If you think that you could join our team, please send your details to Cindy at vetjobaccount@hotmail.com. Vet01 Veterinary Clinic established in 2018 is to provide a variety of veterinary medical services for dogs and cats in Tsuen Wan and surrounding areas. We strive to provide high quality services to all pets and their owners by our knowledge and experiences. Our animal hospital is fully computerized and being equipped with, in house IDEXX lab, UB CAMpro, Aniwear ECG, PetMAP II monitor, high quality digital X-ray machine, ultrasound, anesthetic monitor equipment and more. Recent graduates are also welcome to apply. Has genuine compassion for animals. Confident in most routine surgical cases. Self-motivated, responsible and able to work independently. Good communication skills with clients and colleagues. Fluent spoken and written English and Cantonese, good in computer skills and client interaction. Minimum 1 year experience working in a veterinary hospital. Good communication skills§ Self-motivated and willing to learn. Part Time will also be considered. We are a professional and hospitality family veterinary clinic, also is a well-established small animal practice located in Sai Wan Kennedy Town. Praya Animal Clinic is a fully computerized and well equipped with IDEXX Cataylst One blood test machine, Digital radiography system, Dental machine, Esaote ultrasound, Anaesthetic monitoring equipment, Orthopedic equipment etc. We are looking for Locum Veterinary Surgeons with a good attitude to strengthen our team. If you share our same mission and are interested the vacant, please send your resume and cover letter to prayaanimalclinic@gmail.com. iTrust Veterinary Clinic is a well-established small animal practice located in Ho Man Tin/ Mongkok. Due to rising caseloads and expansion, we are seeking a full-time veterinarian to join our team this year. Our practice is fully computerized and well equipped with IDEXX in-house diagnostic machines, digital radiography system, Esaote ultrasound machine, iM3 dental machine and dental radiography system, anesthetic monitoring devices, orthopedic equipment etc. Sai Wan Ho Veterinary Clinic is a well-established small animal practice located in sai wan ho since 2012. Salary and benefits will be commensurate with experience, ability and performance. Please send CV to swhtest@yahoo.com.hk if you are interested. Responsibilities include (1) assisting veterinarians and researchers to care for and feeding experimental animals; (2) cleaning/replacement of cages and operating autoclave; (3) handling heavy loads; and (4) maintaining environmental cleanliness and daily operations in feeding areas and laboratories; And (5) assist in the management of aquarium facilities and daily operations. The appointee(s) will (a) perform routine animal house maintenance activities, such as routine animal husbandry tasks, general housekeeping, daily observations of animal health, assist with routine equipment maintenance, and collection of specimens for diagnostic testing; (b) provide assistance to Technicians and Veterinarians; (c) perform data collection, data analysis, and input and upload data into database as instructed; (d) support animal workshops at the Centre or the Prince of Wales Hospital; and (e) perform other duties and ad hoc tasks as assigned. Applicants should have (i) completed secondary education; (ii) Grade E/Level 2 or above in at least 5 subjects in HKCEE, including Chinese and English (Syllabus B); OR any combination of results in at least 5 HKDSE subjects (including Level 2 or above in Chinese and English): Level 2 or above in NSS subjects, "Attained" or above in AL subjects (subject to a maximum of 2 subjects), and Grade E or above in Other Language subjects. Those who do not fulfil the requirements in (i) and (ii) above but have completed Form 3 education may be considered for appointment as Veterinary Attendant(s). Applicants must submit copies of HKCEE/HKDSE certificates showing that they have fulfilled the language requirements and/or academic qualifications stated above, otherwise their applications may NOT be considered. Appointment will initially be made on a 1-year contract, renewable subject to good performance and mutual agreement. We are looking for a full time Veterinary Assistant to join our friendly team. A right candidate will be entitled to have 8 days off per month with monthly attendance allowance and overtime allowance. Salary & benefit are negotiable based on experience and qualification. We need yet another Veterinary Assistant to join the friendly team at Dr Hugh's Veterinary Hospital. We are a progressive, well equipped, established practice dealing with dogs, cats and many types of small furry creatures. We also do a significant amount of charity, referral and second opinion work. That means working here is rewarding, never boring, and gives lots of opportunity to learn new things with different species. Candidates should have a patient, service orientated, compassionate and caring attitude toward animals and clients, and fluent spoken and written English and Cantonese. Experience is an asset but attitude is the most important thing. This full-time position offers an 18-22 day month (that's less than 5 days a week), no on-call duty, a salary up to 22k/month + bonus + benefits, 12 to 15 days annual leave, and a very pleasant working atmosphere with friendly staff and nice clients. Support is available for further education. Please apply with resume to drhughvethospital@gmail.com. We need additional veterinary assistants to join the friendly team at Tung Chung Vet Centre with new mangament and expanding . Have a patient, service orientated, compassionate and caring attitude toward animals and clients. Mature, able to work under pressure. 4-5 years working experience preferred, less experience will also be considered. 5 days per week for full time position, short working hours (8 hours per day at the moment). Competitive salary based on experience with 13th month bonus, staff discount, overtiime. A very pleasant working atmosphere with friendly staff and nice clients. Applicants should have Grade E/Level 2 or above in at least 5 subjects in HKCEE, including Chinese and English (Syllabus B); OR any combination of results in at least 5 HKDSE subjects (including Level 2 or above in Chinese and English), Level 2 or above in NSS subjects, "Attained" in ApL subjects (up to two), and Grade E or above in other Language subjects. The appointee(s) will (a) perform routine animal laboratory maintenance and support research activities (e.g., husbandry tasks, general housekeeping, monitoring animal health and welfare, and maintaining a sanitary environment); (b) maintain supplies, feed, and bedding inventories and storage; (c) assist in scheduling regular maintenance of equipment, and collecting specimens for diagnostic testing; (d) provide technical support to animal workshops at LASEC and other CUHK research animal facilities; (e) support the daily operations of Animal Biosafety Level 2 (ABSL2) laboratory, large animal housing, and quarantine facilities at LASEC; (f) provide training for animal researchers on specialized lab safety and basic laboratory procedures; and (g) perform other job-related duties and ad hoc tasks as assigned. Appointment will initially be made on contract basis for one year, renewable subject to mutual agreement. Application should be made online at http://career.cuhk.edu.hk. Veterinary Nurse and Receptionist Required. Tsuen Wan, N.T. There is an Veterinary Nurse & Receptionist position to fulfil in our well established clinic in New Territories Tsuen Wan. What do we expect? Love and compassion towards clients and their pets; honesty, diligence and the ability to communicate and share all aspects of work duties within the team. What we consider most important is the willingness to learn and pass all knowledge to the clients. Furthermore, we prefer someone who has a pet at home and understands our basic Credo. In the package we include all requirements by Labour Law in Hong Kong plus benefits like support for further education, other bonuses will be decided accordingly to the applicants' abilities. We have a long history of providing excellence in Veterinary Services in Hong Kong. We are committed to continually improving the standards of Veterinary Science in Hong Kong and opportunity has opened for the successful candidate. The position will entail medical and surgery duties, TLC nursing duties, Intensive care, translation and customer services. Salary will be commensurate with experience, ability and performance. Included benefits are Health insurance, yearly bonus, overtime pay, monthly commission, annual leave and continuing education (AIRC). All nurses are actively encouraged to study further and must achieve a minimum of AIRC Cert II in Nursing. We have a long history of providing excellence in Veterinary Services in Hong Kong. 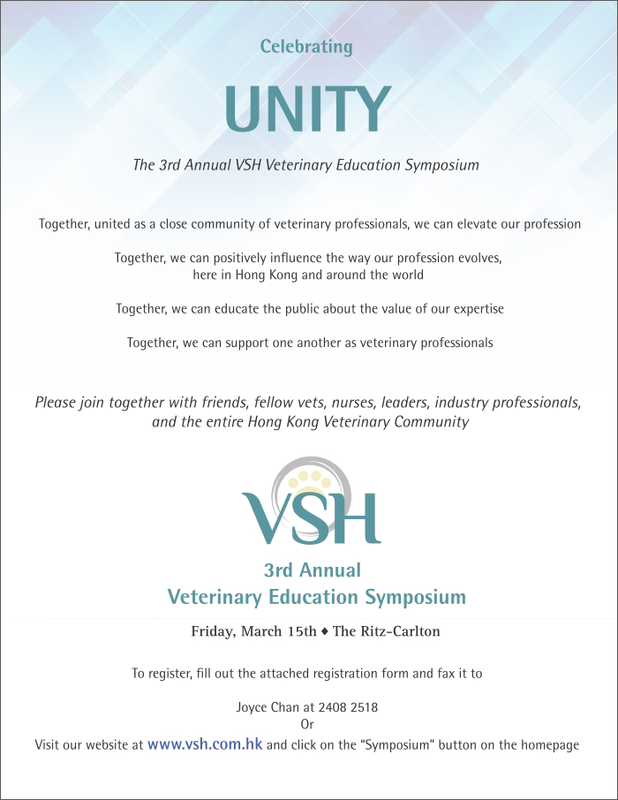 We are committed to improving the standards of veterinary science in Hong Kong. We strive to offer the best service to our clients, and their pets, and am opportunity has opened for the successful candidate. Must have minimum of two years' experience. Further certification (AIRC II/IV etc) is beneficial. Work 3 nights one week and then 4 nights the next week. The night shift is from 7:00pm to 8.00am. The position will entail night duties with monitoring and medicating, TLC nursing duties, Intensive care, translation and customer services. Salary will be commensurate with experience and qualifications, and performance. Included benefits are Health insurance, yearly bonus, overtime pay, generous annual leave and continuing education (AIRC). All nurses are actively encouraged to study further and achieve a minimum of AIRC Cert II in Nursing. Hung Hom Veterinary Clinic is looking for confident people to work as Experienced or Trainee Veterinary Assistants. You will work with our doctors and AIRC trained nurses to help provide the caring, professional service our clients expect and deserve. A genuine care for people and their animals. An enthusiastic, friendly and self motivated attitude. Excellent spoken English and Cantonese. Experience is an advantage but is not required. An ability to learn and undertake training as provided is essential. Working hours are 5 days, 45 hours per week. We offer 12 days annual leave and all public holidays or days off in lieu and a monthly attendance bonus. Salary will be according to experience and skills. AIRC training will be supported after completion of 6 months service. We encourage our experienced VAs to use the skills they have learned to improve our standards of patient care. If you want to start a career as a Veterinary Assistant or you have some experience but want to work to a higher standard please contact us. Tai Wai Small Animal and Exotic Hospital is expanding their hospital and therefore has a new position available for a full-time day shift receptionist and a late shift receptionist. A good level of written and spoken English and Cantonese. An enthusiastic, practical, and hardworking attitude. A willingness to learn and undertake formal training during their employment. Experience in the veterinary field is beneficial but not essential however previous reception and customer service skills are essential. Efficient handling of telephone calls involving bookings and client enquiries. Translating for veterinary surgeons, liaising with clients and team members. Reception administration including completing daily and monthly tasks, maintaining computer records, obtaining medical histories and invoicing. Stocking, ordering and selling of retail products. Must be proficient in Microsoft Word, Excel and Client Management Systems. Salary and benefits are negotiable based on experience and qualifications. We are looking for a medical receptionist who shows mature and cheerful personality to communicate with all levels. Opportunity to be trained as a veterinary assistant in the future for interested parties. Those who are not interviewed within four weeks may consider their applications unsuccessful. This full-time position offers a five-day working week, no on-call duty, a generous salary and benefits package, and a very pleasant working atmosphere with friendly staff and nice clients. Support is available for further education. Konning Animal Hospital is a professional well-equipped small animal practice with relatively spacious and comfortable working area located in Kowloon. Our supportive team is looking for passionate good team players to join us. Assisting with the day-to day smooth operation of a veterinary hospital. Independent with initiative and good interpersonal skills is essential. We are a well established group of practices in Hong Kong. We handle complex medical, surgical and referral cases. Our hospitals are very well equipped with in house laboratory facilities, digital diagnostic equipment and hospital facilities. We have an experienced and competent team of veterinary nurses who assist our vets with consultations, surgery, hospital and intensive care duties. We are now looking for high caliber vet nurse / receptionist to join our team. An attractive remuneration package will be offered to a suitable candidate. At least 2 years working experience, clinical field preferred. Must able to work Wanchai districts. Applicants should have (i) a veterinary degree specializing in laboratory animal medicine; (ii) a minimum of three years of relevant professional experience in managing laboratory animal facilities, preferably at a university setting; (iii) a comprehensive continual professional development profile in laboratory animal science and welfare and health monitoring; (iv) experience in laboratory animal facility modernization, design and planning of new facilities; and (v) excellent administrative, leadership, planning and communication skills. Proven competencies and experience in business management, with relevant business management qualifications such as MBA, will be an asset. Knowledge and experience of the AAALAC accreditation system will be advantageous. The appointee will assist in managing an expanding team comprising Veterinary Technologists, Technicians and Research Assistants, etc. The appointee will be responsible for (a) assisting in overseeing the operations of all animal facilities on campus, the Prince of Wales Hospital, the Hong Kong Eye Hospital, and the Hong Kong Children's Hospital; (b) ensuring the health and welfare of multiple animal species; (c) providing training for animal care workers, research staff and students; (d) advising the University and researchers in issues involving research animal care and use; (e) playing a key role in new strategic projects initiated by the University related to upgrade of animal research facilities and infrastructures; (f) playing a key role in AAALAC accreditation; and (g) playing a role in the business management of the Centre, including but not limited to cost recovery, personnel management as well as budgetary planning and management of funds from internal, governmental and industrial sources. Appointment will initially be made on contract basis for up to three years commencing as soon as possible, renewable subject to mutual agreement. We recently opened our brand new, spacious and well-equipped hospital in Happy Valley. We provide a full range of veterinary services for dogs and cats, including a full range pharmacy, well-equipped in-house laboratory, digital radiography, ultrasonography, endoscopy, computed tomography, advanced soft tissue, dental and orthopaedic surgery, and 24-hour patient care. If you value teamwork, aim to provide high nursing standards for our patients and care about owners' experience, please come and talk with us. We offer a supportive and harmonious work environment, comprehensive medical insurance, overtime and night bonuses, CPD allowance and a competitive salary commensurate with experience. Applicants with relevant work experience and proficiency in English are preferable. Successful candidates will work 5 days or 3.5 nights a week, or a combination thereof, and will rotate to work on weekends and public holidays. Pets Central provides veterinary care and retail services. We have four branches and a mobile clinic. We are looking for people who have passion for working with pets in the veterinary industry to fill the following positions. Self-motivated, independent and good interpersonal skills essential. Work location: North Point / Sai Kung / Tseung Kwan O. Work location: North Point / Sai Kung. Interested parties please send preferred location, full resume with details of qualifications, experience, expected salary, date of availability and contact numbers to hr@pets-central.com. Valley Veterinary Centre is a very well established small animal practice (actually HK's first small animal practice!) on Hong Kong Island. We are practicing in a high quality, purpose fit out facility. The location is great, the clients are excellent and the job is rewarding. We are a high quality, referral and second opinion clinic with nice and friendly clientele. We welcome you to join our team of very competent and friendly vets and vet assistants. You will learn and have fun. An attractive salary with educational, meal and attendance allowances plus overtime and double pay. Be fluent in English and Cantonese. Be cheerful but attentive to details and hard working. Understand quality care to the patients as well as to the owners. Understand the importance of teamwork and has sense of humor. Position available for a Full-Time Veterinary Assistant. We are a friendly well-equipped clinic providing high-quality care to the South side of Hong Kong. We are a progressive, well equipped, established practice dealing with dogs, cats and many types of small furry creatures. We also do a significant amount of charity work. That means working here is rewarding, never boring, and gives lots of opportunity to learn new things with different species. Alfamedic Ltd is a leading distributor in the veterinary industry for over 24 years with our office located in Kwun Tong (5 mins walk from MTR). 3-5 years valuable sales experience in medical, dental, pharmaceutical or veterinary field. We strive to provide top quality services to all pets and their owners by our knowledge and experiences. Our animal hospital is fully computerized and being equipped with, in house IDEXX lab, high quality digital X-ray machine, Dental X-ray, IM3 dental machine, anesthetic monitor equipment, ICU wards, therapeutic laser, shockwave and more. We are looking for people who have compassion in pet services to fill in the following position. The Hospital / Surgery Supervisor partners with the Veterinarians to create a hospital culture based on high quality patient care and exceptional customer service. Responsibilities include managing, planning, and coordinating the overall hospital / surgery activities, and cultivating a supportive and collaborative team environment. Minimum 2-year experience, be an animal lover, priority will be given to candidates with more related experience. Holder of valid driving license (class 1 & 2) is preferred but not essential. Form 7 or above, fluent spoken and written in English and Cantonese. Minimum 3-year working experience, be an animal lover, priority will be given to candidates with working experience in customer service. Handle customer enquiries on products & services etc. Cross-sell and promote products and services. Establish and maintain good relationship with customers. Happy to deal with different kinds of people. Applicants with relevant work experience and proficiency in English are preferable. Successful candidates will work 5 days or 3.5 nights a week, or a combination thereof, and will rotate to work on weekends and public holidays. We offer a supportive and harmonious work environment, comprehensive medical insurance, overtime and night bonuses, paid CPD and a competitive salary commensurate with experience. Applicants with relevant work experience and proficiency in English are preferable. Successful candidates will work 3.5 nights a week, and will rotate to work on weekends and public holidays. He or she will be responsible for the care of hospitalised patients and help with emergency consultations and procedures. Paws in Motion Veterinary Physiotherapy has a unique opportunity for a qualified full-time Veterinary Nurse to join our team in Hong Kong. We are the first veterinary physiotherapy practice in Hong Kong. From our base in Sai Ying Pun, Paws in Motion provides physiotherapy and veterinary nurse care at home. 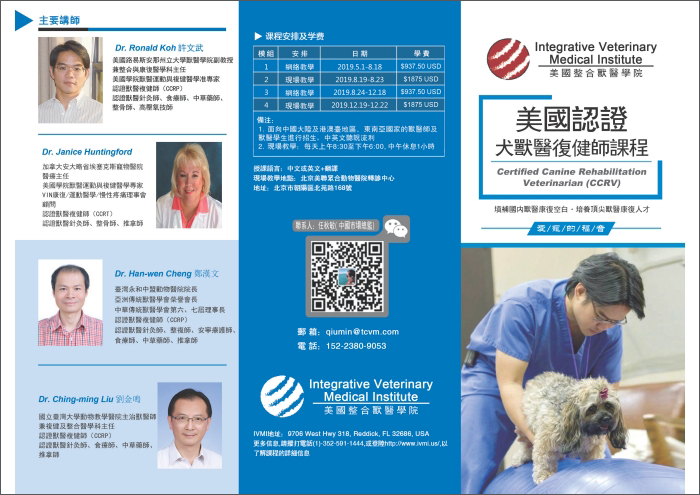 Work and train with one of the only certified rehabilitation veterinarians (CCRT) in Hong Kong and grow your career. Our practice incorporates educating our clients and the public by providing educational resources and support through online courses, workshops and bespoke product distribution into the veterinary industry. Our veterinary nurses work closely alongside our veterinarians to support the veterinary team and our clients and their pets. You will be assisting with physiotherapy to patients under the direction of the veterinary surgeon and providing nursing care and advice. You will support client and veterinary practice communications. By joining Paws in Motion, you will be part of a team that is dedicated to providing the highest standards of care to our patients and clients. This is a fantastic opportunity for a highly-motivated nurse who is looking for a rewarding role. To apply; please send your CV and a letter of application to vet@pawsinmotion.hk. For more information, please email info@pawsinmotion.hk or call Miriam on 9357 7541. Applicants not contacted within 6 weeks should consider their application unsuccessful. The Laboratory Animal Unit is an AAALAC International accredited service department of the LKS Faculty of Medicine, which is committed to provide, promote and ensure the humane care and responsible use of laboratory animals at the University. We are looking for a highly motivated individual to join our rapidly expanding team. Applicants should possess a good Bachelor's degree, with at least 4 years' administrative work experience; an excellent command of written and spoken English and Chinese; proficiency in IT; excellent organizational, interpersonal, communication and problem-solving skills; experience in event coordination; and the ability to work independently and supervise a small team of administrative staff. The appointee will handle administrative tasks related to human resources, financial management and customer service, and may be required to perform periodic duty roster on Saturday mornings. The University only accepts online application for the above post. Applicants should apply online (http://jobs.hku.hk/cw/en/job/494062/executive-officer) and upload an up-to-date C.V. Review of applicants will start as soon as possible and continue until March 15, 2019, or until the post is filled, whichever is earlier. Paws in Motion Veterinary Physiotherapy has a unique opportunity for an exceptional Administration Assistant to join our expanding team and help support our customers. We are the first veterinary physiotherapy practice in Hong Kong. From our base in Sai Ying Pun, Paws in Motion provides physiotherapy care to pets within the home and at veterinary practices. Our office is based close to HKU MTR station. By joining Paws in Motion, you will be part of a team that is dedicated to providing the highest standards of care to our pet patients and clients. We are a young and energetic clinic which aim at providing professional and sincere medical service to both animals and clients. We are now seeking responsible and mature animal lovers to work with us. If you are interested, please send your CV, expected salary and any reference documents to ivetemploy@gmail.com. Well established fully equipped veterinary Clinic located in Kowloon for sale. Owner has to leave Hong Kong for personal reasons. Price negotiable. Due to personal reason, I have to sell the veterinary clinic. We can discuss in details. Price negotiable. We are seeking a new investor who interested to maintain the clinic business. Our location is in Kowloon, A well-equipped with the most advanced equipments and are in very good condition. Our practice has been built up a well relationship at this community, we are looking for someone who can keep the clinic growing up and the business has been developed. It is with great pleasure that we would like to invite you to an open night at our new veterinary facility, at Trinity Tower, Sham Shui Po, Kowloon. We would like to invite our referring veterinarians from throughout Hong Kong, to visit the facility before it goes into active service (scheduled for the following week). This will be a great time to tour the facilities, and share a glass of wine or beer and a snack with some of the clinicians of CityU VMC. A long time in the planning, and following a renovation lasting more than 12 months, we are now ready to move into this new veterinary medical centre, which boasts a floor space of 33, 000 square feet, over three levels. Stainless Steel Shoreline cages throughout. We are very proud of this facility and would like to personally show you through the new centre, which will be a beacon of quality veterinary care for years to come. To let us know if you will be attending. We are pleased to announce that Dr Antony Goodhead will be available for Ophthalmology Cases from 31 March 2019 to 4 April 2019. Dr Antony has been performing consultation and surgical services in Hong Kong for the last ten years. Dr. Antony Goodhead qualified with a BVSc in 1990 and MMedVet [Ophth] in 1994, he worked as veterinary Ophthalmologist in referral practice from 1994 to 1997, and is a Senior Lecturer [Part time] at Onderstepoort Faculty of Veterinary Science from 1997 to present, his duties include lecturing both pre and post graduate students, he is also a mentor and co mentor for two post graduate veterinary ophthalmologists. For further details regarding referral or appointment, please contact Wanchai Animal Hospital at 2572 5422. We are pleased to announce that Dr. Ross Christopher Elliot, will be available for consultations and surgery procedures from March 18th to March 22nd at Victory Animal Hospital, Mong Kok. Dr. Ross is a registered veterinarian in Hong Kong and is a registered South African Veterinary Surgical Specialist. He is however not registered in Hong Kong as a specialist surgeon. Dr. Ross Elliott Graduated from the University of Pretoria, South Africa in 2005. He then entered into a surgical residency at the Bryanston Veterinary Hospital through the University of Pretoria. He completed his residency in small animal surgery in 2011. During this time he completed a dissertation in the surgical CT anatomy of the canine abdomen, which produced 2 publications in Veterinary Surgery. Ross has been working as a specialist surgeon at the Bryanston Veterinary Hospital for the last 6 years as a specialist surgeon. During this time he has produced multiple publications in international journals. These include an article on successful treatment of a double chambered right ventricle in a dog under cardiopulmonary bypass. Ross's main surgical interest lies in total hip replacement surgery, cranial cruciate ligament surgery, elbow dysplasia and medial shoulder instability in canines, new ways to treat patella luxation in dogs, advanced spinal surgery (especially in large breed wobblers), urogenital surgery, and portosystemic shunt attenuation. Dr Ross is doing Total Hip Replacement surgery and is available for evaluation and assessment of patients for this as well as for the procedure itself. In the last 6 years of referral work Ross has attended an advanced arthroscopic course in Munich, a complete course in linear and hybrid fixation using the Imex systems, a microvascular surgical course and a Biometric stifle and a BioMedtrix hip replacement course and is certified specialist in all these procedures. Ross is happy to help with any surgical referral and prides himself on excellent patient care and compassion with feedback to the referring veterinarians. Please call Victory Animal Hospital on 27110332 to make appointments/for further inquiries. We wish to advise that Dr Cedric Tutt, a Veterinary Dentistry Specialist, will be available for dental consultations from Wednesday 6th March to Wednesday 13th March at Phoenix Animal Clinic, Wan Chai. He will be available for dental consultations and all dental procedures including root canals and oral surgeries including mandibulectomies and maxillectomies. Please call Phoenix Animal Clinic on 28654320 to make appointments. Graduated with BSc(Agric) in 1984 and undertook research in aromatic and fragrant plants. Moved to Cape Town 2004 and referral hospital providing a dentistry and oral surgery service. Presented dentistry and oral surgery lectures at congresses in Europe, UK and South Africa. Application form, please click here. Registration Form, please click here. Symposium Program-Doctor, please click here. Symposium Program-Nurse, please click here. 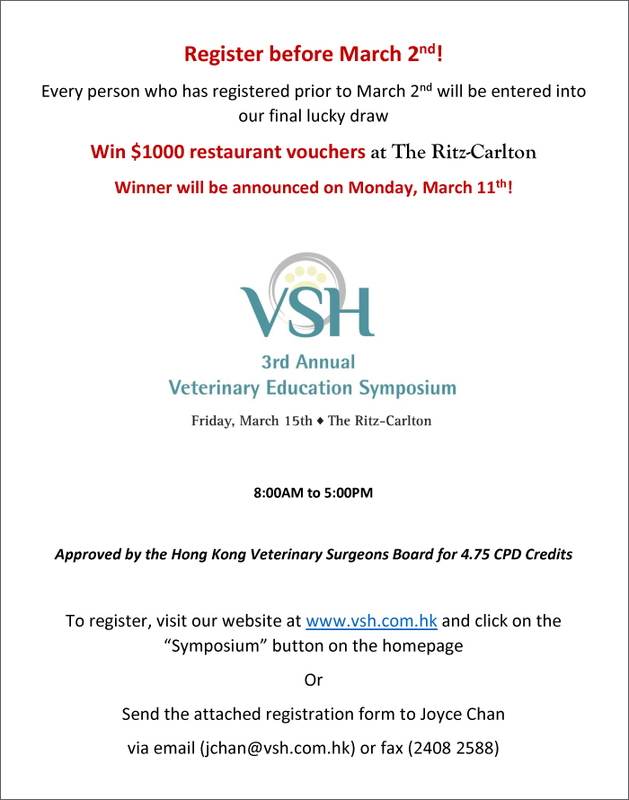 VSH 3rd Annual Veterinary Education Symposium - Final Lucky Draw! 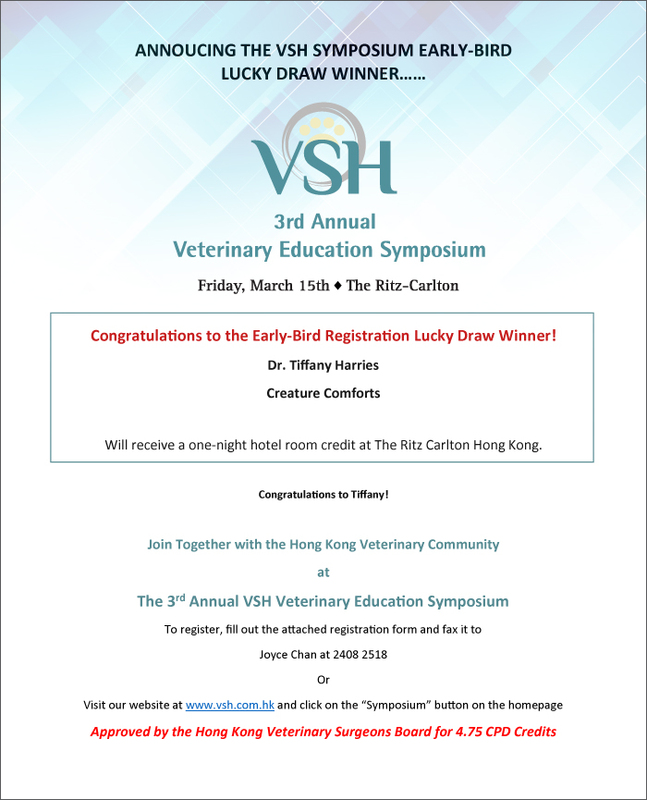 3rd Annual VSH Veterinary Education Symposium - Congratulations to the Early-Bird Registration Lucky Draw Winner! 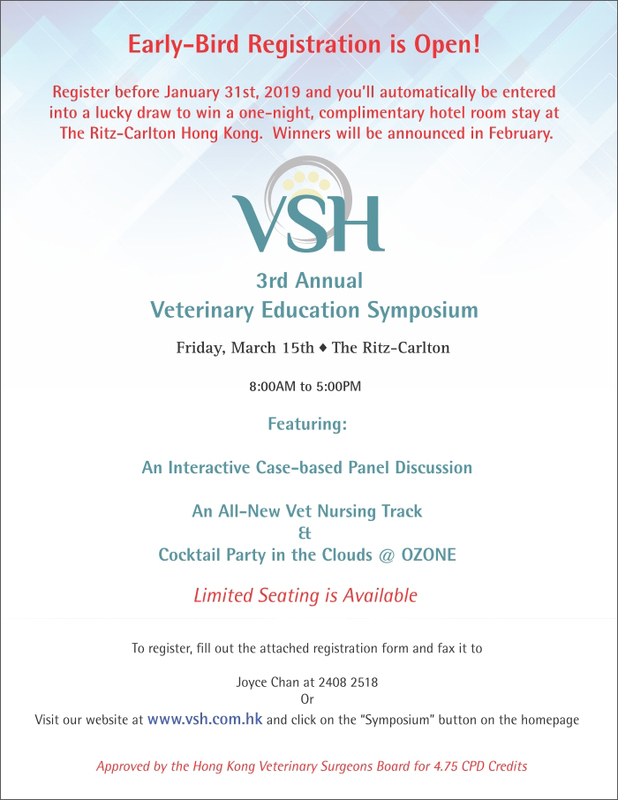 VSH 3rd Veterinary Education Symposium Early Bird Registration Is Open!